Joy's Simple Food Remedies: Tasty Cures for Whatever's Ailing You | Your #1 Source for Kindle eBooks from the Amazon Kindle Store! Do you often wake up in the morning not feeling your best? Maybe it's a nagging cold, a dreaded hangover, uncomfortable bloating, or low energy? Or perhaps it's something more chronic, such as PMS or seasonal allergies. This book will help you feel markedly better. 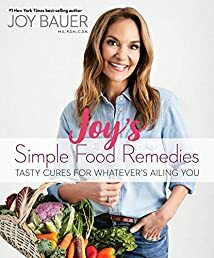 In Joy's Simple Food Remedies, #1 New York Times best-selling author and TODAY show nutrition and health expert Joy Bauer tackles 20 of the most common everyday ailments. For each ailment, she explores the science, explains the cause, and offers the top healing foods. You'll also enjoy delicious and easy-to-make recipes that are busting with feel-good ingredients. The 90/10 Weight Loss Cookbook: 100-Plus Slimming Recipes for the Whole Family – Plus a Complete Shopp..